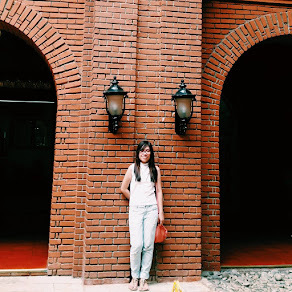 R0ckstarm0mma.com's New Year Giveaway: A Jollier 2014 with Jollibee Chickenjoy Bucket Treats ~ Hey Mich! I always join online contests whenever there's an opportunity. Thanks to another online contest enthusiast for informing me about this. 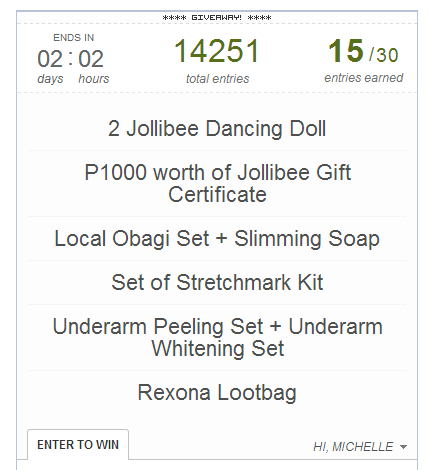 I really want to win these amazing giveaways because, ① I wanna give those adorable Jollibee Dancing Dolls to my nieces. I know they would like it. ② February 6 is my lola Del's 81st birthday and that 1k worth of Jollibee gift certificate is the right gift to her, knowing that she craves for only Jollibee whenever we're hungry. ③ I have disgusting stretchmarks at the back of my legs. That gives me uneasy feeling when I am wearing skirt and shorts. I have tried different products but they just don't work. Hopefully the giveaway can help me with my dilemma.